Captain Sakae Oba and about forty-six other members of his force held out after the Battle for Saipan hiding in the caves and jungles, carrying out occasional guerrilla actions against U.S. forces, which had declared the island secured in July 1944. His force officially surrendered to American forces on December 1, 1945. His group was the last organized resistance of the Japanese forces on Saipan. Some of his men returned to Saipan back in the 1980s. Oba had heart problems in later life, and died sometime in the 1980s. Jones, Don. Oba The Last Samurai. Presido Press, 1986. 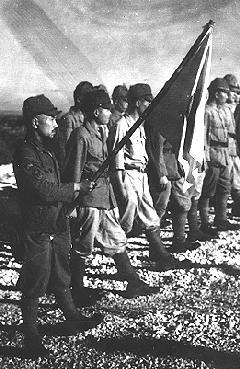 (far left) Captain Oba holding regimental colors during his official surrender.